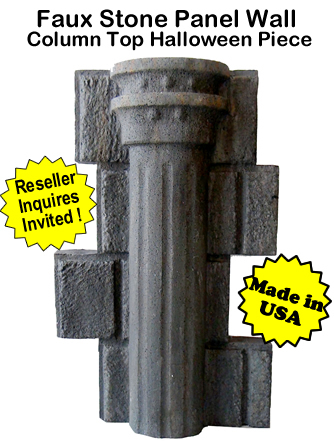 Faux Stone Panel Column Top- Halloween - Dino Rentos Studios, INC. 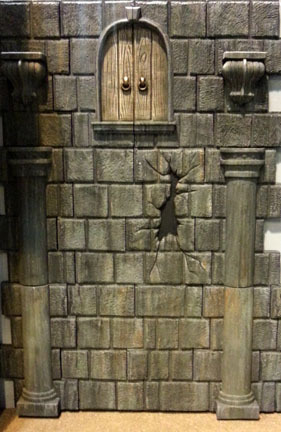 Create your own dungeon, castle or creepy crypt scene with these Faux Stone Panel Column Top Halloween pieces! Each 32" x 20" panel can be ordered painted or unpainted and has full perimeter flanges to make them bolt easily to any wall for permanent fixture. The puzzle lock design provides seamless looking results! These are great for home haunts, professional haunted attractions, or anyone looking to create theme-park-quality set design. Choose from different interchangeable designs and create your own rock wall installations. These Faux Stone Panel Column Top Halloween pieces are priced for the cost-conscious consumer by allowing you to order a single panel up to as many as you need to fill your space! Set the mood for your customers, partygoers or neighbors with this amazing Faux Stone Wall Panel System today! See installation video for more details. See painting video for painting instructions.